The soon to be opened Central Festival Chiang Mai located on the 2nd ring road. Shopping malls in Chiang Mai has seen tremendous investment over the past few years with big malls like Promenada Resort Mall opening earlier this year and the 7 billion baht Central Festival Chiang Mai due open November 14, 2013. Between these two malls there has seen investment of 10 billion baht with 320,000 sqm in Chiang Mai. These two malls have both seen local businesses invest and increased investment in Chiang Mai. The Central Group’s “Central Airport. Plaza “ covers 175,185 sqm and had a total investment of 3 billion baht. Kad Suan Kaew covers an area of 290,000 sqm and invested over 5 billion baht. Chiang Mai now has more community malls than most provinces in Thailand and is the biggest market regionally as within the next year it will have more than 1 million sqm in malls. A survey by ECC International Real Estate Development and Management Company Limited, a leading national department store of The Netherlands, stated that Chiang Mai continues to grow with around 3 million people or 11,000 families. People from the country are moving to the city to work and the needs of these families continues to grow. According to reports, retail business grew 250% from 2001-2010, but the shopping areas had not kept pace with that growth. In addition to outside investors local investors such as the V Group under Mr. Watchara Tuntranont, the One Stop Service Developer, and also the director of the Business Park is growing. They have invested 2 billion baht for the new Platinum Fashion Mall in Chiang Mai which is on 9 rai of land in the Chiang Mai Business Park opposite Airport Plaza. This will be not only the biggest place for wholesale and retail fashion but also the largest IT center and will provide parking for 1500 cars. Completion is expected within a year. The 20 year old Kad Suan Kaew recently announced planned renovations that will open up 70,000 sqm to support more retail space. 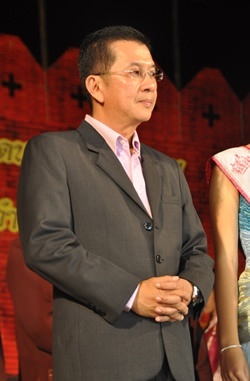 The Vanusnan Group by Mr. Chadchan Ekachaipatanakul, MD of V Development Co., Ltd. And President of Chiang Mai Vanusnan Co., Ltd, has just built a community mall at the second ring road, beside Payap University under the brand “V Community” There is a condominium and shopping mall of 3 rai. The Rimping Group by Tantranont Family has also expanded with branches in the Promenada Resort Shopping Mall, Star Avenue Lifestyle Mall, Chayayon Community Mall and a branch in the yet to be completed Maya shopping mall. The Nim Sii Seng Group has invested in Nim City Daily under the name “Old Chiang Mai Project”, acultural and Lanna style of shopping mall of more than 200 million baht. Planned retail projects include the renovation of the Amari Hotel at the Rincome intersection to become the “Landscape Plaza” a garden style mall and across the street the Think Park Art Community on 5 rai is adding a condo to the shopping complex there. Chiang Mai is becoming more and more a retail city to cover the needs of the growing developments, city planning has not kept pace with this growth and time will tell how the direction of management will go. Newin Chidchob (left) poses with representatives of Buriram United Football Club and ONYX Hospitality Group at a press conference to announce the new football themed hotel. Thailand-based ONYX Hospitality Group has been appointed to operate a 60-room football themed hotel in Thailand’s North Eastern province, Buriram. Amari Buriram United is owned by Buriram United Sport Hotel Co., Ltd. It will be operated by ONYX Hospitality Group under the Amari brand. The design concept for Amari Buriram United is a tribute to football and of course the local team, Buriram United. Guests will check into a hotel, but could easily mistake arriving at a football ground. The hotel structure has a stadium design with most rooms looking into a central area which includes a mini football field and swimming pool. The hotel is designed by I’ll Design Studio, the same architects as the neighbouring i-Mobile Thunder Castle stadium. Inside the hotel, guests will enjoy ‘players changing room’ style bathrooms and a themed restaurant with bench style seating, replicating team style dining. Amari Buriram will feature 44 superior rooms, 14 deluxe rooms and 2 suites ranging from 34 to 114 square metres in size. The resort will also offer a bar and a gymnasium. The property is scheduled to open in Q4 2013. There always been an issue for the acquisition of the land by foreigners in Thailand since Foreigners are not permitted to own the land. On February 27th, 1970 a treaty allowing the citizen of 16 countries to be able to hold land was cancelled, thus making it not legal for any foreigner to purchase land in hailand. A foreigner may acquire land through statutory inheritance, ie such as a legal spouse or biological child. The heir can inherit only 1 rai of land for commercial or residential purposes or 10 rai of agricultural land. However, the Minister of the Interior must give his permission. 1. The foreign person has brought money not less than 40 Million Thai Baht for the purpose of investment and maintaining such investment not less than 5 years. · An investment in an activity as declared by the Board of Investment to be an activity eligible to be granted promotion of investment under the law on promotion of investment. This acquisition of land is only allowed for the personal residential purpose and the family, if it is found they are not adhering to the rules and regulations they must give up their possession of their portion after 180 days but not more than 1 year. However, if the disposal of the ownership has not been taken place, the Director General of the Land office reserves the right to sell by auction. The Director General also has the rights to dispose of the land by auction if the land has not been utilized for the residential purpose within 2 years from the date of approval. An article about condo ownership will be coming shortly as the regulations for owning a condo are far different. Ornsirin Group, one of the leading property developers in Chiang Mai, has been in business for over 7 years and has grown along with Chiang Mai, according to the CEO of Ornsirin Group, Boonlert Buranupakorn. Ornsirin CEO Boonlert Buranupakorn talks about the future plans for this Chiang Mai property developer. Ornisirin Group has grown to include condo developments, townhomes, housing estates and commercial properties. The company has the advantage of large land holdings in many areas of Chiang Mai, allowing it to develop at a better price and allowing for far lower costs than newcomers to the Chiang Mai property scene. Ornsirin Group has developed 21 projects since 2006; over 6,000 units of commercial buildings, housing estates, and townhomes under the brand Ornsirin, 9 condominium projects with a total of 720 units under the brand The Next Condominium by Ornsirin and 2 condominiums with a total of 500 units under the brand The Astra. Total projects are valued at over 20 billion baht. Single house projects of Ornsirin are including Ornsirin Park View on the Chiang Mai – Mae Jo Road, Ornsirin 2 River View on the Chiang Mai – Phrao Road near Maejo University, Ornsirin 3 Lake & Park on the Third ring Road in Doi Saket district, Ornsirin 4 Natural Park at km 4 on the Chiang Mai – Phrao Road, Ornsirin 5 Modern Life in Doi Saket, Ornsirin 6 Lakeside & Park on the Third ring Road, ORNSIrin Mountain & Lake 7 to 12 and Ornsirin 14. In the future, the group plans to expand the project to other provinces in the North to support the expansion of the residential community of the upcoming AEC. There is also the Ornsirin Townhome on the Chiang Mai – Phrao Road and condominium projects under the brand The Next Condominium by Ornsirin, The Next 1 located near RuamChok intersection and The Next 2 near Nong Pratheep intersection and the latest condominium project, The Astra Condominium on Chang Klan Road beside Shangri-La Hotel Chiang Mai. The Astra is a luxury premium class condominium, centrally located in one of the best locations in the city. Ornsirin follows 5 main goals; safety, high quality, good location, selection of good customers who live together in a quality society and excellent service. By following these Ornsirin has seen regular growth in its projects.